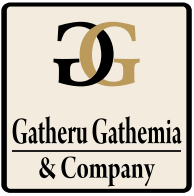 Gatheru Gathemia and Co. Advocate was established in 1992 by the sole proprietor Mr. Gatheru Gathemia. The firm mainly dealt with civil litigation services, but in the recent years we have diversified to and now offer a range of legal services to clientele who include both the corporate as well as individual’s clients. Our Firm seeks long-term, partnering relationships with clients, to the end of providing the best total solution to the client’s legal needs. We at Gatheru Gathemia and Co. Advocates know what it takes to meet our clients’ expectations for excellent work and responsive service. We have distinct quality standards of practice which in turn ensures that clients are properly and consistently represented and advised. We acknowledge ethical and professional responsibility to clients, the courts and the public at large. We deliver legal solutions that are practical, innovative, specialized and cost-effective. Our goals are to develop and maintain a high level of performance, adhere to the ethical standards of the standards of our profession and endeavor to satisfy the needs of our clients. We are dedicated to providing the highest quality legal services available and treat every client’s problem as if it were our own, and focus on achieving the best results possible. It is our goal that all of our clients will give us their highest personal recommendation. To be the firm of choice for clients with respect to their most challenging legal issues, most significant business transactions and most critical disputes. We strive to be an instrumental part of each client’s success.